Mermaid Birthday Chalkboard - Printable DIGITAL FILE - Purple & Teal Mermaid Birthday Board - Any Age! Other Hair Colors Available! Commemorate your child's major milestones and favorites on his/her birthday with this customizable sign. I EDIT, YOU PRINT! Perfect to display at your child's MERMAID party or as a prop for birthday photos! Mermaid Party Invite - Printable DIGITAL FILE - Purple & Teal Mermaid Invitation - Any Age! Other Hair Colors Available! Mermaid Birthday Invite - Printable DIGITAL FILE - Purple & Teal Mermaid Invitation - Any Age! Other Hair Colors Available! 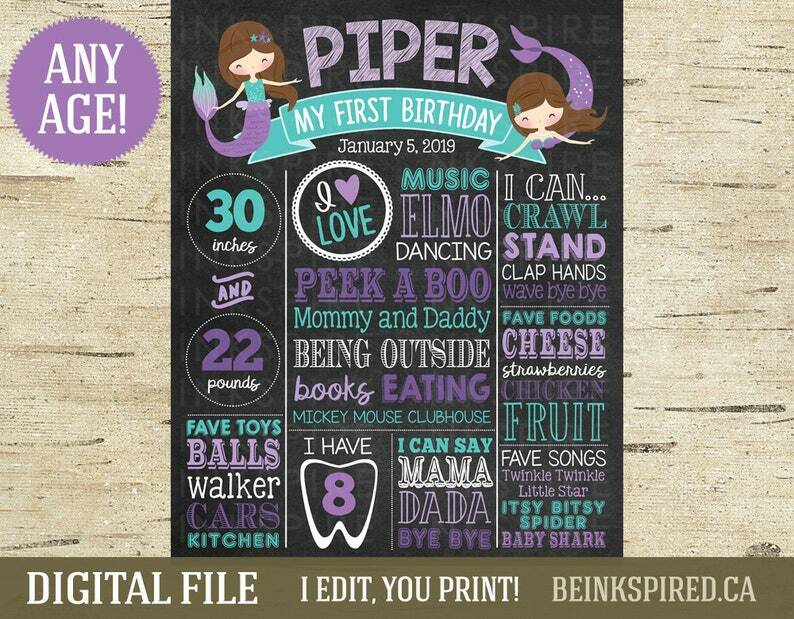 Little Man Birthday Chalkboard - Printable DIGITAL FILE - Boy First Birthday Mustache Board - Any Age! Other Colors Available! Mustache Birthday Chalkboard - Printable DIGITAL FILE - Boy First Birthday Moustache Board - Any Age! Other Colors Available! So cute. Exactly what I wanted! I will definitely order from you again. Thank you!! Mr Onederful Birthday Chalkboard - Printable DIGITAL FILE - Boy First Birthday Mustache Board - Any Age! Other Colors Available! Pink & Teal Mermaid Invite - Printable DIGITAL FILE - Mermaid Birthday Invitation - Any Age! Other Hair Colors Available!